The class of 2012 where it all began: Convocation in 2008. Of the 463 Bates College students that will graduate on Sunday, May 27, women number 256 members of the class and men, 207. 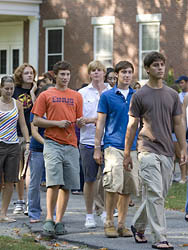 Forty-three of the students are from Maine and 193 from other states, with 34 of the United States represented in the class of 2012. Twenty-eight of the students hail from outside the U.S., representing 21 countries. The class of 2012 is apparently ready for a major election year. Fifty-five students earned a degree in politics or political science (the name of the major was changed while this class attended Bates, and students elect majors at different points in their careers), making that subject the most popular in the class. Psychology ranked second, with 54 students. History came third, with 52 students. Fifty-two women and 26 men were double majors, with economics, politics and Spanish the most popular second majors. Last year, Bates graduated 58 double majors. One man and one woman graduated as triple majors this time around. Watson Fellowship recipient Romina Istratii of Athens, Greece, majored in Chinese, economics and politics. Jeffrey Berry of Redondo Beach, Calif., recipient of a Fulbright English Teaching Assistantship, majored in French, German and history. Seventy-eight members of the class of 2012 earned bachelor of science degrees, indicating that the student took 100-level courses or the equivalent in chemistry, mathematics and physics. The remaining 385 students earned bachelor of arts degrees.